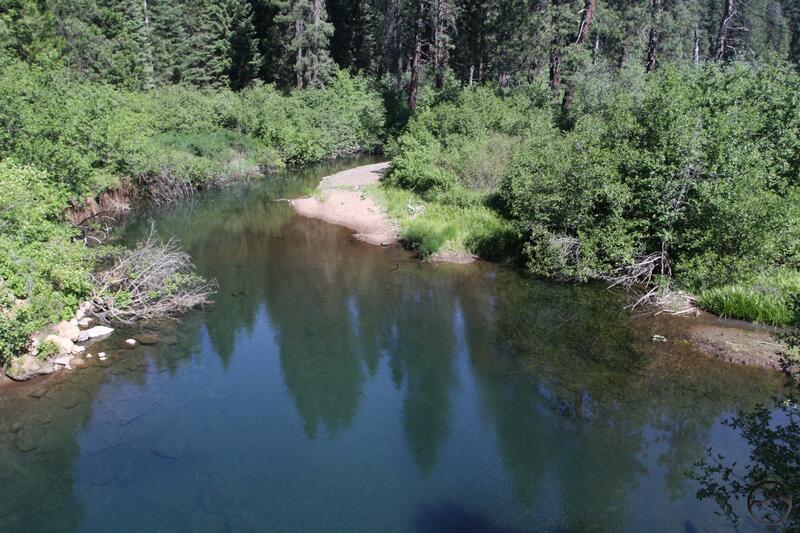 A varied and scenic hike along the McCloud River that passes a great swimming hole and an unusual bayou-like area formed by a historic bridge. 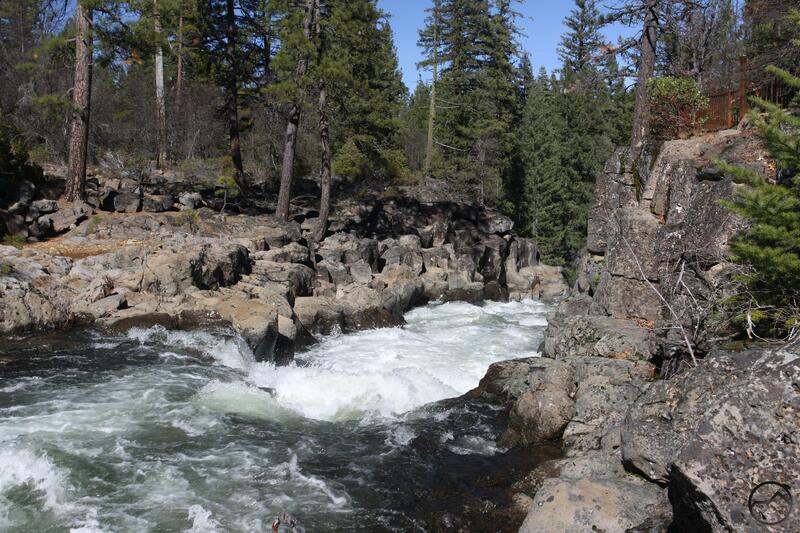 Further downstream the river becomes swift moving through volcanic rock formations, culminating in the uppermost of the McCloud River’s famed trio of waterfalls. The McCloud River below the Bigelow Bridge. The McCloud River from the River Trail. The portion of the McCloud River Trail between Camp 4 and Upper Falls is the last part of the trail that receives little use. 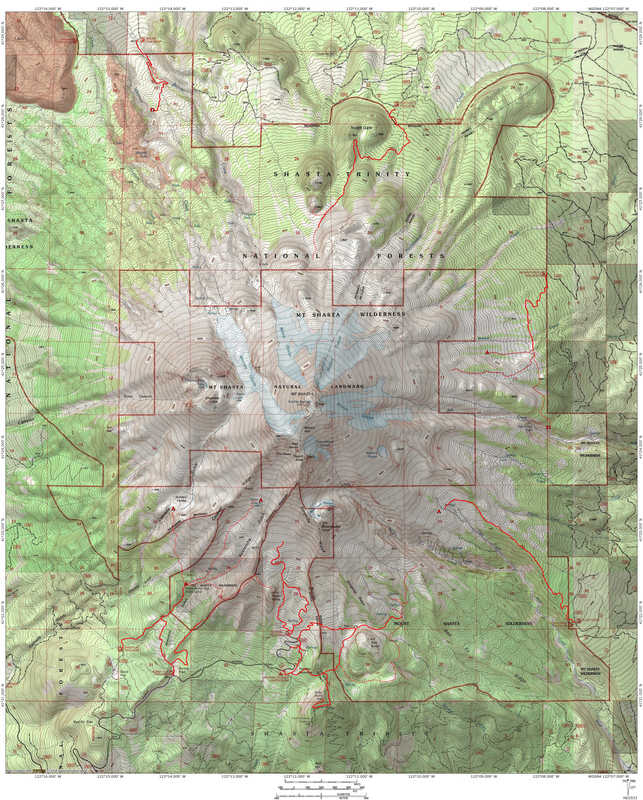 The rest of the trail, as one hikes west, is one of the most heavily trails in the Mount Shasta area. 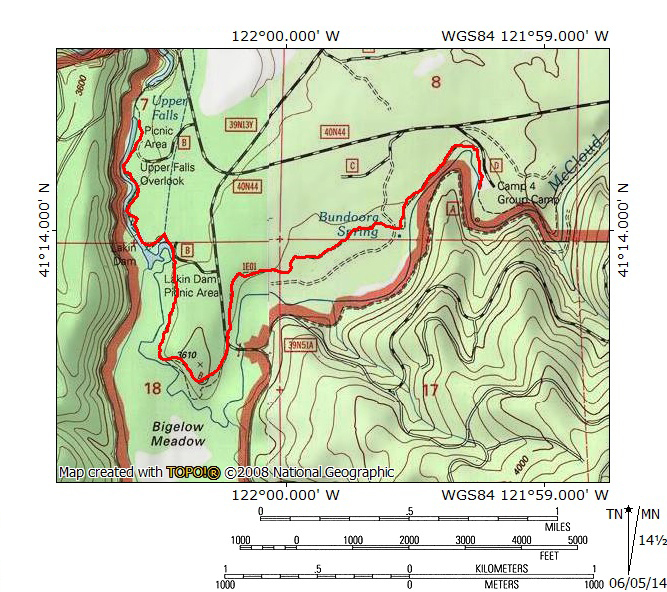 Due to the level of use and the striking, spectacular scenery, that section of the McCloud River Trail has been treated separately and discussed as if one were hiking west to east, which is the way most hikers enjoy that part of the trail. However, like the rest of the River Trail, the section leading up to Upper Falls is best hiked along in east to west orientation. This section of trail is also the most varied by a wide margin. The trail has some of the usual riverside scenery that has typified much of the trail prior to Camp 4, as well as some of the forested hiking when the trail veers frustratingly far from the water in an effort to stay clear of the high water mark. Thankfully, the trail also passes some interesting new features. There is a large bayou type area where the rivers current is stilled and it meanders through several channels cutting through dense brush. 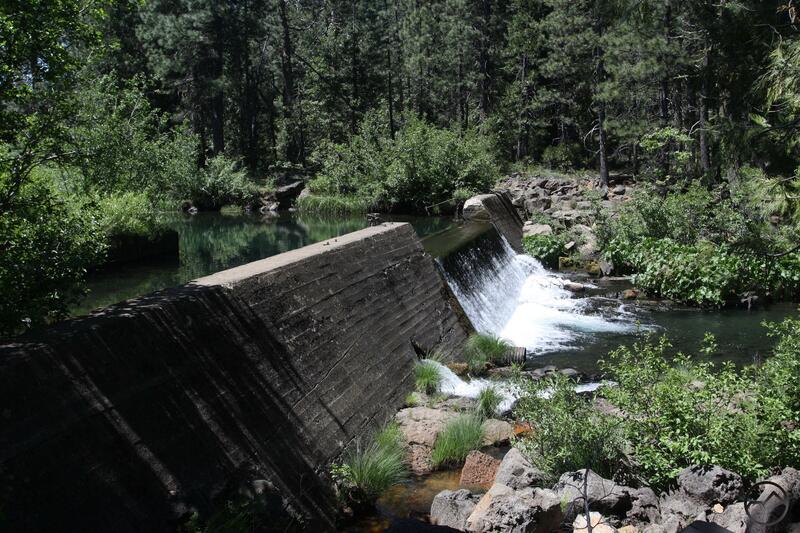 History buffs will also be fascinated by the Lakin Dam, a small diversion dam that once supplied water for the Mill in McCloud. Although it is not a natural waterfall, the river pouring over the dam is still a pleasant sight. Below the dam the river is swift moving through increasingly common volcanic features, including a significant amount of basalt and some ancient lava flows. This is indicative of the increasingly rugged geology that will produce the three famed McCloud River Falls, which lie just up ahead. It is worth noting that while this account of this section of the trail that begins at Camp 4 ends at Upper Falls, it is only a short distance further to the superb Middle Falls, which is the highlight of the three waterfalls. Continuing on to this wonderful cataract adds an exclamation point to an already excellent hike and provides an opportunity to watch the geology surrounding the McCloud River run from level, pacific forest to rugged, volcanic river canyon. The river leaving the Camp 4 area. 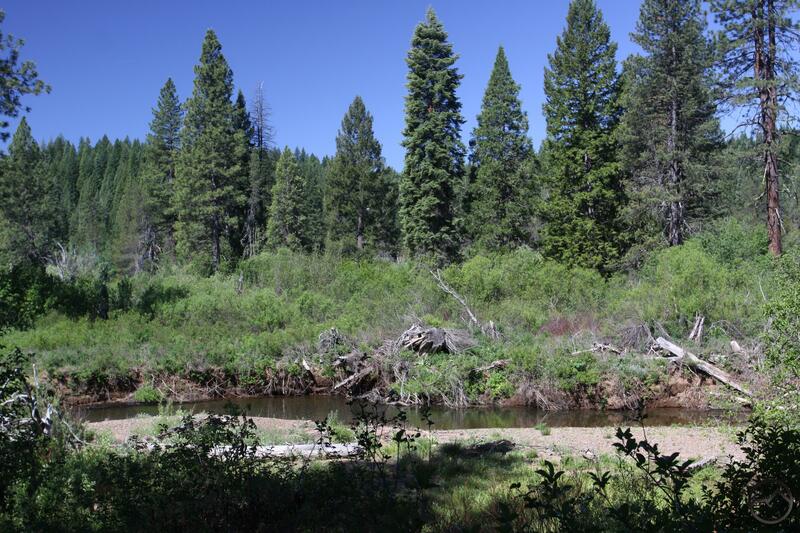 Camp 4 is a pleasant group camp on the banks of the McCloud River. It makes a handy embarkation point for the final leg of the McCloud River Trail before reaching the famed trio of waterfalls. Leaving the camp along the river, the trail initially passes through a scenic meadow with the river on the left. The river is 8 to 10 feet below the meadow level, at the bottom of a steep, boulder strewn embankment. The gold color of the soil and lack of tree cover give the river a bright, unusual appearance when compared to other sections seen earlier. The trail soon veers away from the river briefly before the two courses reconvene and follow a parallel path for a ways. Watch for the tight horseshoe bend near where the river turns to the west. From here the trail stays in the general vicinity of the river, though it is usually not directly adjacent to it. The river and trail soon make a turn to the south and continue to run parallel to each other all the way to the Bundoora Spring, about 0.65 miles from Camp 4. 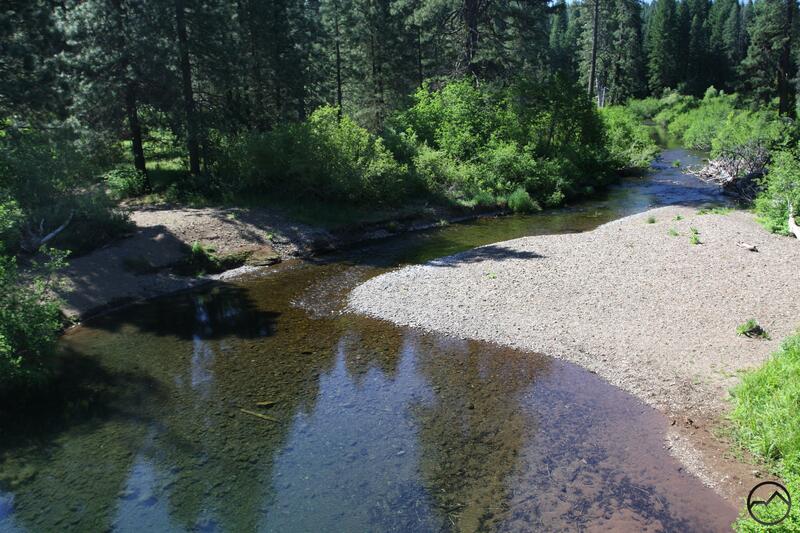 The McCloud River upstream from the Bigelow Bridge. Past the spring the trail turns completely away from the river as it crosses an old dirt road. 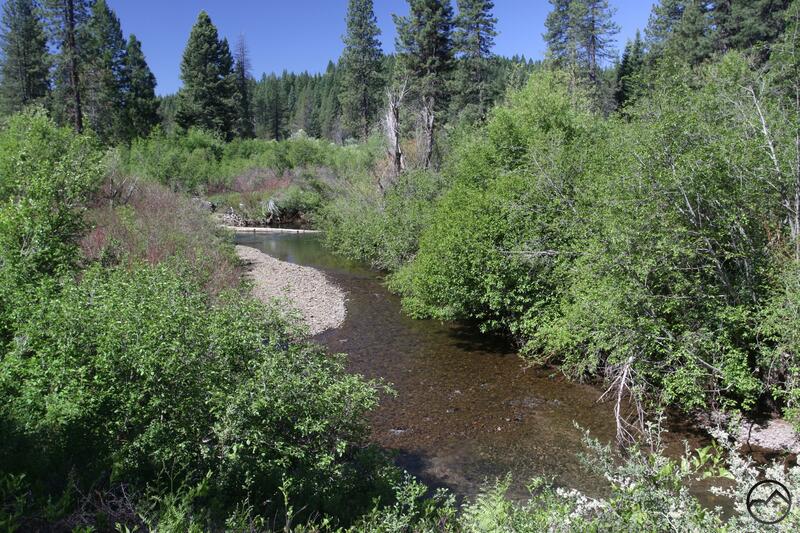 It continues west, well away from the river and passes through a pleasant forest consisting primarily of ponderosa pine and cedars, along with a few firs and some riparian denizens. After maintaining a westerly course through the increasingly monotonous woods for 0.65 miles the trail makes a turn to the south and emerges onto a dirt road. Although the trail continues on the far side of the road, it is worth making the short jaunt to the south on the road to the Bigelow Bridge, essentially a large steel plank that provides access to the far side of the McCloud. There is a fantastic swimming hole beneath the bridge and a large, albeit rocky, beach from which to enjoy the water. Beyond the bridge the rivers current quickens as it passes through a hedge of riverside brush. The entire area around the bridge makes a fantastic spot to stop, take a break, and enjoy a dip in the river. The last quick-flowing water before the bayou-like area. Once back on the trail the path again stays well away from the river, though the racing water is at times audible and is occasionally visible. As the trail turns from a westerly direction to the north the vegetation along the river gets much denser. Note that the trees on the horizon are much further away now. This marks the beginning of both the Bigelow Meadow and the adjacent bayou area. The meadow is never visible from the trail but it can be reached by crossing the Bigelow Bridge and some good route-finding. The bayou-like area is formed by the Lakin Dam, which is a short distance downstream. It has backed the river up and allowed it to develop multiple channels through the level area. Only the easternmost channel is visible from the trail as it makes its northward journey. This is a nice section of trail, with views of the river first, followed by the slower, impounded waters. There are also some glimpses of the summit of Mount Shasta, a rare opportunity to see the mountain from the McCloud River Trail. Eventually the trail arrives at the Lakin Dam picnic area. Some picnic tables are scattered around the area and there is a vault toilet. A particularly interesting feature is the large wooden pier that has been constructed out into the slow moving water. It was presumably built to provide handicapped access for fishing but some of it looks like it is in rough repair and may be questionably efficacious for wheelchairs. Still, the area is quite peaceful and very rarely used and makes a for a shady, serene place to sit and relax before the river becomes much more kinetic and the trail get much more exciting. To experience the energy, continue on the wide path past the bathroom. Pass by a chain link fence as the sound of falling water becomes louder. In short order the trail arrives at the Lakin Dam. A broad concrete wall about 8 or 9 feet high, the dam extends across the river’s channel, impounding it and forming the expansive bayou area the trail just passed through. The dam was built to power the lumber mill in McCloud. An aqueduct once carried the water from the small reservoir to town. Now water gushes out of the aqueducts egress in addition to spilling over the lip of the dam. The McCloud River races over Upper McCloud Falls. 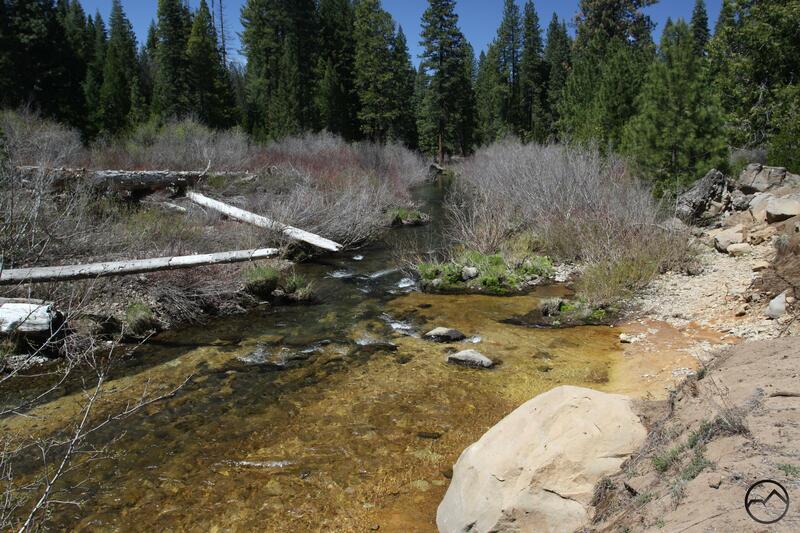 Beyond the Lakin Dam, the McCloud River is a quick moving, boisterous waterway. The trail now follows the river closely, giving hikers plenty of opportunities to enjoy the water. Another highlight of this section of trail is the marked increase in the presence of lava rock. Layers of basalt are frequently visible and testimony to the ancient lava flows that once covered the area. So prevalent does this rock become that the trail crosses over large rocky areas, a departure from the typically sedimentary terrain that characterizes most of the rest of the trail. Finally the river slows down briefly one last time near a series of picnic tables and tall trees. This marks the begging of the Upper Falls picnic area. Beyond this point the river enters the narrow, rocky gorge that immediately precedes the precipice of Upper Falls. It is an exciting conclusion to a scenic hike. For those looking for an even more dramatic conclusion, the spectacular Middle Falls of the McCloud River is only 0.4 scenic miles further. From the main intersection in the town of McCloud, drive east on Highway 89 for 5.5 miles. Turn right on the signed road for the McCloud River Loop. Continue for 0.7 miles. Turn left at the stop sign and drive 2.5 miles to the intersection with the dirt road leading to Camp 4, passing the stops for Middle and Upper Falls and the unsigned road leading to the Lakin Dam en route. Turn right on the dirt road accessing Camp 4 and proceed a short distance to the camp and parking area. We’re interested in hiking the McCloud River Falls Trail, especially the three waterfalls & the middle one in particular. There’s so much written we’re struggling for the basics. How long the trail is, the best place to start/park, picnic areas & restrooms along the trail. Are there places to dip our feet or swim? Anything pertinent that can help is much appreciated. Thank you in advance. Requesting basic information on McCloud River Falls Trail, where to park/start, picnic areas & restrooms. Places to dip our feet or swim. How long is trail from lower to upper falls. Any basic information is greatly appreciated. Thanks so much for this amazing website! I am going to be staying at Camp 4 and can’t find much about it online. Thanks for your endorsement of the area and the suggestion for this hike–I will definitely be taking it!